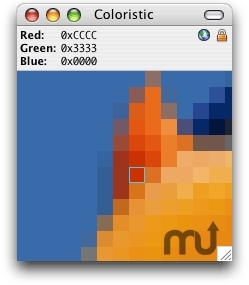 Screen magnification utility displays color values. Is there a better alternative to Coloristic? Is Coloristic really the best app in Author Tools category? Will Coloristic work good on macOS 10.13.4? Coloristic is a simple utility which magnifies the area of the screen surrounding the cursor. It will also display the color value for the pixel that is exactly under the cursor and allow you to copy that color value to the clipboard. In addition, you can measure the distance between any two pixels on screen, and save the magnified image to a file or the clipboard. Coloristic needs a rating. Be the first to rate this app and get the discussion started!